O Lord Jesus Christ, Thou Word of God and Son of Man, Creator and Redeemer, possess our mind and conscience, our heart and imagination, by Thine indwelling Spirit; that we and all people, may find and rest in that Love which is Thy very Self. We are now fully sold out for tickets, and so we have decided to make non-viewing tickets available. These tickets will be for seats where you cannot see the speaker, but you will be able to hear the talks, and they will be sold be sold for a lower price. If you would like such a ticket, or if you would like to have your name on a waiting list, in case of cancellations, please email us! 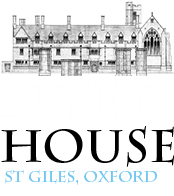 Located in the heart of the city of Oxford, and very close to Pusey House, Keble College offers en-suite accommodation in comfortable student study bedrooms. Rooms are located in the Grade 1 listed buildings designed by the Victorian architect, William Butterfield, as well as in our modern award winning buildings. All bedrooms benefit from a daily service, fresh towels and toiletries, tea and coffee making facilities with biscuits and a full English and continental breakfast served in our beautiful Victorian dining hall, the largest within the University. Accommodation at Keble College is limited, however further information will be made available at St Anne’s College and Kellogg College through us once Keble has reached capacity. John Behr, Dean and Professor of Patristics, St. Vladimir’s Orthodox Theological Seminary, New York. Anthony Burton, Rector of the Church of the Incarnation, Dallas, and sometime Bishop of Saskatchewan, Canada. Paul Dominiak, Dean of Jesus College, Cambridge. Ian McFarland, Regius Professor of Divinity and Fellow of Selwyn College, Cambridge. Oliver, O’Donovan, Professor Emeritus in Christian Ethics and Practical Theology at the School of Divinity in the University of Edinburgh, and sometime Regius Professor of Moral & Pastoral Theology and Canon of Christ Church, Oxford. Mor Polycarpus Augin Aydin, Metropolitan and Patriarchal Vicar for the Archdiocese of the Netherlands of the Syriac Orthodox Church. Lydia Schumacher, Senior Research Fellow, King’s College London; Director of European Research Council Project on Early Franciscan Thought​. Johannes Zachhuber, Professor of Historical and Systematic Theology, Fellow and Tutor in Theology at Trinity College, Oxford.